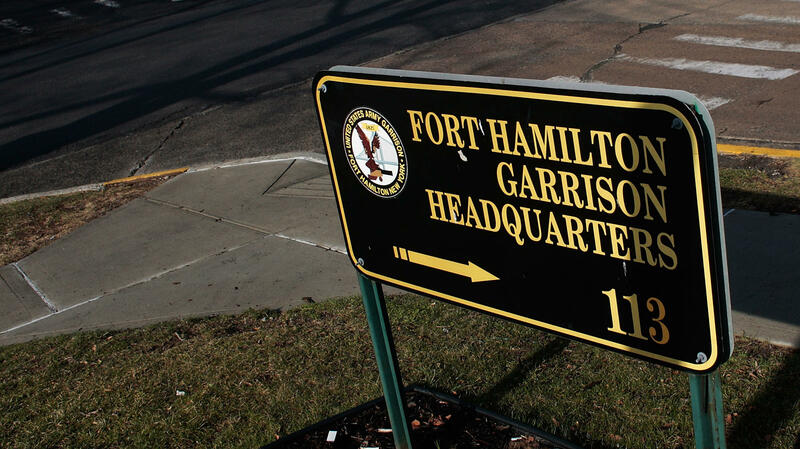 Fort Hamilton is one of the oldest military bases in the country and the only active U.S. military base in New York City. Elected officials in New York City are trying to stop the deportation of a pizza delivery man who was arrested while bringing food to an Army base in Brooklyn. Pablo Villavicencio, an Ecuadorean immigrant, was delivering pizza to U.S. Army Garrison Fort Hamilton last Friday when he was detained and handed over to immigration authorities. In a statement, the Fort Hamilton Public Affairs Office says security officers discovered an active ICE warrant during a routine background check. And that the installation's commanders are authorized to take "reasonably necessary and lawful measures [to] protect installation personnel and property." At a news conference outside the base on Wednesday, Brooklyn Borough President Eric Adams called it "unimaginable" that Villavicencio went so quickly "from delivery to detention." Villavicencio's wife, Sandra Chica, appeared at the news conference with the couple's two young children, who were both born in the U.S.
"This is cruel that they're going to separate my daughters from him," Chica said. "He was supporting the family. Now I'm going to be by myself, along with two kids." Chica says she is a U.S. citizen and that Villavicencio had applied for his green card in February. City Councilman Justin Brannan, whose district includes Fort Hamilton, said that Villavicencio worked for a pizzeria in Queens and that he had delivered to the Army base in Brooklyn many times before, without incident. "Why was this time any different from any other times Pablo came to deliver food to the Army base?" Brannan asked. "Why was Pablo singled out?" According to Immigration and Customs Enforcement, Villavicencio was ordered to leave the country by an immigration judge in 2010, but he stayed in the U.S. ICE spokeswoman Rachael Yong Yow confirmed that Villavicencio was detained by military police officers and turned over to ICE and that he remains in the agency's custody pending deportation. Brannan questioned why authorities would arrest a man who was simply trying to deliver pizza. "This is absolutely ridiculous. We're tearing families apart," Brannan said. "Are we any safer today because they took a pizza delivery guy off the street?"